‘Remember the Sabbath day and keep it holy’. Do you also have to remember the night, even if it is the Christmas’ Eve night? The single father known from The Decalogue, One is looking at the window of his neighbours living on the first floor, sitting around the table and waiting for Christmas presents. A happy idyllic picture of a loving family shatters when Janusz goes out provoked by his ex-lover Ewa. They drive around the deserted city under the pretext to find her missing husband. In the morning the old feelings seem to explode again but little Christmas carol singers ring the doorbell singing about the birth of Jesus at the early hours. 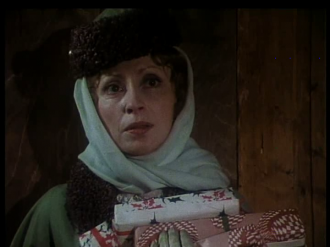 Before the dawn Ewa reveals to Janusz that she made a dangerous bet with herself as she did not want to spend the Christmas Eve’s night alone. The other woman, Janusz’s wife, has been waiting for him all night long suspecting what was the true reason of his disappearance. ‘Was it Ewa? – Ewa…’ This episode referring to the third commandment shows a comprehensive understanding of the Decalogue: breaking only one commandment leads to a violation of the remaining ones. Janusz leaves his family; he lusts, drives recklessly putting his and others’ lives at risk, whereas Ewa balances on the edge of adultery, thinking of suicide; they both lie. 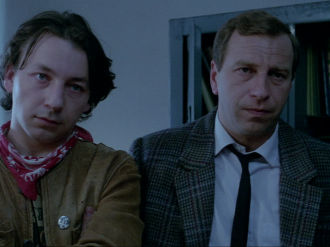 Kieślowski watches their weaknesses and confused lives with sympathy; he lets them find the way out. 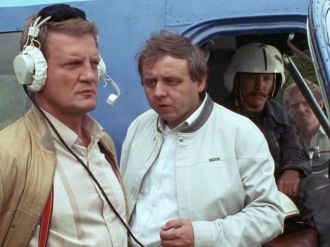 The character played by Artur Barciś, driving a tram into which direction Janusz speeds becomes a symbol: you should keep to the right way. The final scene showing Janusz’s confession and his wife’s silent forgiveness also brings hope.